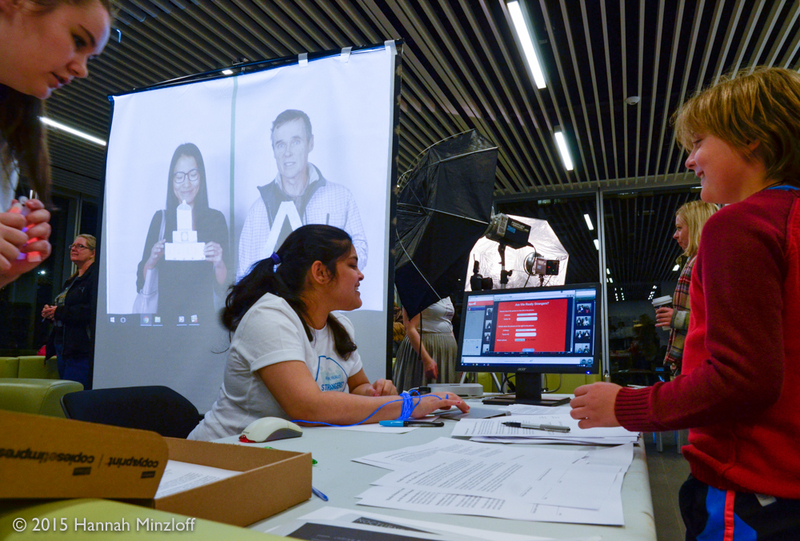 The first part of the installation is a pop-up photo-studio where strangers were photographed in pairs. Two open lanes provide a controlled area where participants line up; for each photograph one person from each lane is taken to form the pair. These images are uploaded to a visualisation of a social network map, comprised of honeycomb shaped cells projected on a dual-sided screen. The photograph of each pair of strangers will appear in a cell, with one stranger in each half. The second part of the exhibit explores connections between these two strangers and demonstrates how they are part of a highly connected community. 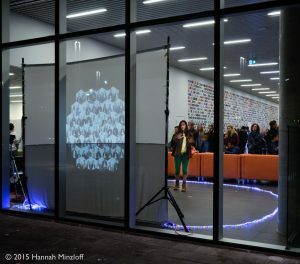 Participants stand in front of the network map where their photograph and that of previous participants will be visible within honeycomb cells. They use their hands to initiate one of two interactive modes. In link creation mode, attendees can make connections between cells by first pointing his/her hand at their image causing that half of the cell to be highlighted; the other hand will be used to select the person they know. Once both half-cells are highlighted, a connection is made and stored within the map. Participants can also draw connections between individuals other than themselves in the same manner. In exploratory mode, an attendee can examine these connections by using one hand; when a person is selected, cell-halves with people connected to that person become highlighted, and the honeycomb visualization rearranges and reveals 2nd, 3rd, and 4th degree connections, possibly folding back to include the other half of the honeycomb. Are We Really Strangers was exhibited as part of Nocturne:Art at Night, October 18th 6pm-midnight, at the Halifax Central Library. Attendees also gave consent for their interactions to be recorded and analyzed. 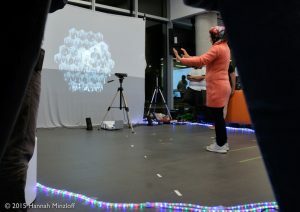 Interactions with the interactive projected display were captured using software logging and video. Software logs recorded interaction details, and form a useful source of design feedback for our walk-up-and-use visual interface. Video was recorded to give more information about interaction (frustration, failed tracking, crowd engagement, conversation). No interviews or questionnaires were administered. The objectives were to gather usage data in order to get design feedback, and to have a record of the event as a case study of a dynamically generated visual social network in a public community setting.